We’ve discussed previously what the benefits of blogs are to B2B businesses. Between attracting new customers, answering frequently asked questions, and positioning yourself as an expert in the field, there are plenty of reasons why you should be blogging. But we often have people ask us WHERE they should be blogging? If you do a general Google search asking about blogging tools or platforms, you’ll find all sorts of options where you can start your own blog. But when you complete registration, you’ll be asked with many questions about where to host your blog. 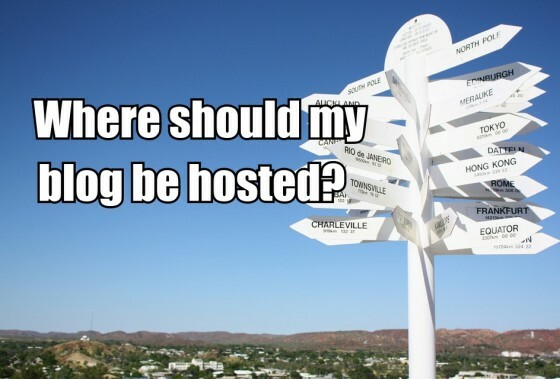 Do you want to host it on your own domain or on a separate domain? It may seem like a throwaway question you’re presented with during the excitement of getting your blog off the ground, but it’s an important one. Today, we’ll try to give you insight on what each blog set-up does for your company, why you should consider both, and ultimately, what the best option is for your business. On-site blogs are probably the most commonly seen blogs. This blog is in fact an on-site blog! As we’ve referenced in previous posts, on-site blogs work wonders in providing your website with fresh content on a regular basis. This fresh content is a major boost to your rankings in search engines, as the more attention you’re giving your website, the more search engines will value it as a strong website to point users towards. Another great benefit of on-site blogs is to keep branding similar throughout all your platforms, and build on a cohesive user experience. Jumping from one site to another which may have different designs and branding can often be jarring for visitors. Keeping them familiar with your business on your blog by offering a cohesive experience can help in building trust with them and new business. Depending on what you want out of your blog, an off-site blog may be an option for your company. The main benefit of an off-site blog is in adding support to your main site through link building. Link building is a technique which shows search engines other website domains value your website enough to link to your website. You can review information on link building through some of our previous posts, but for a company, link building through a separately hosted blog can be an option. It also allows you to step out from under your company’s brand umbrella occasionally. Some businesses may have a parent company, or such a strong brand name attached to them, it makes it hard for more casual conversations (like blog commenting) to happen online. Having an offsite blog where potential customers feel welcome to interact without feeling intimidated by a major brand name could be beneficial. In our opinion, the benefit of having a blog on-site for many B2B businesses far outweighs the minimal website health boost you’ll get from link building by hosting your blog off-site. The reality of business websites, particularly industrial companies and their websites, is there may not be dedicated staff around to always update your main website content. Instead, having many team members submit a blog post which is added regularly to the site covering various topics and in various styles can quickly address the issue of keeping your website fresh. Also, if one of your posts goes viral or becomes a heavily linked post online, you want to bring those visitors into your website directly, and not through a secondary, off-site source. Having them on-site will bring them one step closer to a business conversion! So now you should have some general understanding of the benefits of blogging for businesses, as well as where to host your blog. But now what to write about? In future posts we’ll provide some ideas to help get you started on providing content for your business blog. In the meantime, feel free to browse all of our blog posts which have covered the topic of “Blogging” by clicking on our category link. Enjoy!